How the strategies selected were implemented and evaluated in terms of their effectiveness. Include both qualitative and quantitative performance information. Super-insulated shell: The home is built on 12 of EPS geofoam, achieving an R-50+ foundation assembly. Its walls, wrapped in 6 of polyiso and filled with high- density cellulose insulation, reach nearly R-60. The roof is R-80. High-performance fenestration: Karuna Houses thermally- broken, triple-paned Optiwin windows are installed with over-insulation to achieve R-8 in assembly. All south, west, and east-facing windows are shaded with a motorized exterior venetian blind system for passive cooling and to balance solar gain and daylighting. Exterior doors are super-insulated and airtight. Exterior venetian blind system open and closed. Air and moisture management: The home's rain screen system, air barrier system, and moisture management detailing keep structural sheathing warm and dry, ensuring that the core structure of the building can last for perpetuity. These systems, combined with filtered air supplied by the homes HRV system, also ensure superior indoor air quality for Karuna House. Advanced mechanical systems: A super-efficient air-to-water heat pump system provides domestic hot water and heating, via hydronics, to the home. The most efficient HRV available, coupled with a top-quality ducting system, delivers a constant stream of conditioned, fresh air to bedrooms and living areas. An on-demand hot water distributed system with super-insulated pipes minimizes water waste and energy loss. Top-of-class appliances bring the highest levels of efficiency available, including refrigerator, induction cooktop, dishwasher, and washer/dryer. High efficiency LEDs light the home. Net positive energy building: The 9.9kw solar PV array, manufactured locally, is modest in size for a home of this size. But thanks to the very low energy loads of the building, this array satisfies, on a net basis, enough energy to heat and cool the home and power the client's electric car, with energy to spare to sell back to the grid. FSC-certified wood: All wood used in the project was FSC-certified. The homes cedar cladding was milled from locally sourced salvaged timber. Comprehensive sustainability: In addition to the broad sustainability benchmarks required by LEED Platinum certification, the home also adhered to Minergie-ECOs stringent ecological requirements, including non-toxic materials (similar to Living Building Challenges Red List), protections for installer health, provisions for quiet building operation, and a cradle-to-cradle eye to ease of building disassembly. In qualitative terms, Karuna House is a gracious space to occupy, characterized by superior thermal comfort, solidity, and quiet created by the structures airtight, super-insulated construction. But it also features an unparalleled sense of inside-outside connection thanks to a continuous supply of filtered fresh air, natural daylighting, and views to the outside through high performing windows. In human ecology-speak it is the protected prospect, cozy but connected. The multiple certifications that Karuna House has earned provide expanded, third-party verification of this qualitative success. Its energy performance-focused PHIUS+ Passive House certification testifies to the projects superior hygrothermal performance and durability and to the thermal comfort of occupants. The broader sustainability focus of its LEED for Homes Platinum certification ensures that site selection, water conservation, sustainable materials, and occupant health met a very high bar. And the projects Minergie- P-ECO certification overlays another set of energy and sustainability imperatives, notably around occupant experience, builder health, and retrofit flexibility that certify that Karuna House meets the very highest standards of performance and sustainability. In quantitative terms, the strategies employed at Karuna House drive the home's energy consumption so low that the home is a net positive energy building. The first years' solar production from the 10 kW solar array was 11,623 kWh, while energy consumption, as measured by the home's PowerWise monitoring system, was just 10,782 kWh. There was a limitation on how much glazing the project could accommodate and still hit its energy performance goals. And given that this project was highly design-driven, generous use of windows was highly valued by both architect and client. However, by fine-tuning the plan for fenestration, tweaking R- values in some places and using different types of glass in others, the final design did not have to sacrifice much glazing. Midway through the design development process the team did discover a simple elevation error in the energy modeling done by the Passive House consultant that required significant improvements, midstream, in the home's energy performance. This potential crisis instead became a small bump in the road thanks to nimble work by the integrated team. Architect, Passive House consultant, and Passive House builder all worked together to create a cost-neutral solution, increasing glazing in some locations, decreasing it in others, decreasing the overhang on the south facade by two feet, and switching from EPS to polyiso insulation on the roof. This successful response to an unexpected and serious design challenge demonstrated both the flexibility of a performance-based approach to high-performance building like Passive House and the power of iterative design when done by an integrated team. The architect could experiment with solutions in SketchUp and then work with the energy consultant and builder to examine energy performance and buildability implications. Ultimately, this allowed the aesthetic and programmatic design of Karuna House to be unhindered by the energy imperatives of the project, even as it was informed by them. Given the aesthetic focus of the project, the entire team understood that any decision had to be viewed through the lens of design. High-performance building flexibility was key to ensuring the highest design quality while also achieving three of the world's most stringent green building certifications. Positive and negative aspects of the process. The composition of the project team that allowed goals to be met. As described in the previous section, the process of iterative design with an integrated team powered by the flexibility of the Passive House approach to high performance building made the project possible. It allowed the team to fuse high design with high-performance building, to reach net positive energy, and to be the first building in the world to achieve the green building triple crown of LEED, Passive House, and Minergie certifications. The only negative aspect was that it was time consuming and labor intensive to meet the projects multiple performance, design, and certification goals. That says more about the nature of the goals than anything, however. The process was probably the most time-efficient way to meet the goals of the Karuna House project. The description of the efficacy of building materials, systems, and product selection at Karuna is organized in four sections: foundation system, wall assembly, windows and doors, and mechanical systems. Foundation System: The first task was to lay Karuna Houses foundation, both structural and thermal. To do this we built the entire structure on foam, pouring the concrete foundation atop a thick layer of EPS (expanded polystyrene) geofoam for an R-56 assembly. Excavation at Karuna carefully balanced cut and fill onsite to eliminate the need to transport dirt on or offsite. LEED-compliant straw erosion control protected disturbed earth from the effects of rain. Once excavation was complete, the construction team laid down the EPS (expanded polystyrene) geofoam foundation layer and poured the foundation footings on top. A capillary break material coats the top of the footings to block moisture transfer up into the foundation stem walls, and the edge of a 15 mil vapor barrier layer is centered on the footings and then laid out onto the underslab geofoam, providing a continuous barrier between the concrete slab and insulation. The LEED and Minergie-ECO-friendly concrete used for Karunas foundation contains 30% fly ash and locally-sourced aggregate. Wall Assembly: With the Karuna House's high-performance foundation laid, the next step in building the advanced envelope was to create an airtight, watertight, vapor permeable, and super-insulated wall assembly that would control energy flow through the building while ensuring durability for the life of the structure. Interior walls of the green building are finished with lime plaster, 100% natural and VOC-free, applied on 5/8 drywall. Next is the stud wall, built entirely from Forest Stewardship Council certified wood, with high-density cellulose insulation (R-21) blown into the cavities between studs. The cellulose insulation consists of recycled newspaper and naturally buffers moisture, contributing to the wall assembly's durability. Over 12 tons of cellulose were used at Karuna, easily dwarfing any other insulation used on the project, by weight. Immediately outside the cellulose insulation layer comes the air barrier, a layer of plywood sheathing covered with a continuous, vapor permeable liquid applied membrane (Prosoco R-Guard). The air barrier prevents air from flowing through the wall and ensures that the cellulose cavity insulation performs at its highest level, shielded from air penetration and the moisture it carries. The air barrier also keeps out wind-driven rain, protects sheathing and framing from moisture, and, because it is vapor permeable, allows the wall assembly to dry out from the inside in the unlikely event that moisture intrudes to the interior portion of the wall assembly. This air barrier is wrapped by an overcoat of a 6-thick exterior layer of foil faced polyiso foam (R-40) that brings the insulative value of the overall wall assembly to nearly R-60. The three layers of 2-inch foam nest into a superstructure of Z-joists that staggers each layer's seams. Vapor permeable tape seals exterior seams. This continuous overcoat is key to the wall assembly's performance and durability. In addition to allowing very little heat loss, it also protects the structural air barrier by keeping it warm and dry. The warm band of yellow that encompasses the air barrier layer in the diagram below comes thanks to these three layers of polyiso foam. Finally, Karuna House is wrapped with a rain screen system built of FSC-certified cedar siding held one inch off the polyiso foam by FSC 1"4 battens. The airflow that this rain screen cavity facilitates across the face of the wall assembly provides constant drying and drainage, ensuring long-term performance and durability. Windows and Doors: The fenestration at Karuna House is central to the homes aesthetics, its HVAC system, its wall assembly, its airtightness, its comfort, and its energy performance. The windows at this green home building project are triple-glazed, high solar heat gain, R-8 windows made by Optiwin in Austria. These windows have a very thin frame (the weakest part, thermally-speaking, of a window) so that the whole frame can be over-insulated and fully embedded into the wall assembly. The R-8 windows are net-positive in energy performance because they capture so much solar gain. Incidentally, the same glass attributes that make a window good at capturing solar heat gain also make the windows very clear, with better daylighting and better views, two key elements of the architectural experience. Because high performance windows can be so good at capturing solar heat gain, shading becomes important, especially in the shoulder seasons when sun angle brings lots of rays into the home but outdoor temperatures are still mild. On modernist homes, with their clean lines free of traditional, shade-providing overhangs, the potential for overheating is more acute. Exterior shade systems, like the one at Karuna, make modernism in Passive House feasible, without sacrificing comfort. The exterior doors at Karuna are also Optiwin, with the exception of the cellar door built by Hammer & Hand. A bit like vault doors, these highly insulative doors are thick with insulation, gasketed, and airtight, equipped with multipoint locking mechanisms to ensure a tight seal. Windows at Karuna are viewed as part of the HVAC system because they are so connected to the design of the homes mechanicals. The warm interior temperatures of high performance windows lead to lower thermostat settings by occupants. This increased comfort combined with the overall increase in energy performance brought by high performance windows means that heating and cooling equipment can be significantly downsized and simplified. Part of the HVAC strategy to reach net zero energy use at Karuna is to use a low-temperature radiant system throughout the floors of the home, harnessing the heat transfer power of water to balance temperatures between rooms. This strategy would be impossible with draft-inducing, energy-losing conventional windows. High performance windows are critical to the success of the heating strategy at Karuna House. Mechanical Systems: One of the challenges in high performance building is finding mechanical equipment small enough to match the low energy load and efficient enough to meet the usage requirements. A Daiken Altherma air-to-water heat pump provides all the domestic hot water for the house as well as the heat for the homes low-temperature hydronic radiant floor system. The all- electric Altherma has very high efficiency "over 300% when it's heating low-temperature radiant water " which means it produces three times the energy required for its operation. It's also variable speed, so it modulates with the load, which further reduces its electric consumption. Karuna House not only generates its domestic hot water efficiently, it also reduces losses through its distribution system. First, the hot water supply pipes are carefully sized to reduce the amount of hot water left in the lines after each use. Second, every hot water line is fully insulated from the mechanical room all the way to the fixture. Finally, an on- demand hot water recirculation system limits waste. A Zehnder heat recover ventilator unit delivers comfortably warm, fresh air throughout the house while using very little energy and making almost no sound. Karuna's super-efficient, all electric mechanical systems require so little power that the homes 9.9 kW PV array, with locally-sourced panels from SolarWorld's Oregon facility, provides all the energy needed, on a net basis, to power them. The house, whose owner is a vintner, replaces an existing structure on a vineyard parcel. As described above, the construction team employed erosion control and balanced cut and fill to limit site disturbance during construction and limited nuisance to neighbors as well as carbon footprint by avoiding the hauling of fill to or from the site. Simple, native, drought-resistant landscaping around the home blends with its agricultural context. The home-on-a-vineyard matches the rural nature of the surrounding community, and sustainable transportation is provided via the homeowner's electric vehicle, which is charged by the homes PV array. Accessible: The entry of the house is grounded, barrier-free, and wheelchair accessible, as is the guest wing is fully wheelchair accessible. While the other areas of the home are not wheelchair accessible, an open floor plan supports the universal design goals of easy visual access and ample maneuvering room. Aesthetics: The home was driven by high design goals of the client and architect. A restrained visual palette combined with deft manipulation of rectilinear forms slipping past one another results in a quiet, livable, yet powerful architectural composition. The design excellence of the home was recognized with a 2013 design award by the Portland chapter of the American Institute of Architects. Cost-Effective: While the homes interesting architectural design and fairly expensive finishes do not make it an example of affordability, the performance elements of the home were cost-effective, guided by the cost-optimization power conferred by the Passive House Planning Package (PHPP) and the parametric analysis it allows. This power became particularly important, as described earlier, when an error by the energy consultant was discovered mid-project. The team was able to collaborate, using PHPP and SketchUp, to achieve a significant increase in energy performance in a cost-neutral way. Functional/Operational: Using SketchUp as a visual aid, the architect worked intensively with the client to identify spatial and programmatic needs and accommodate them in the most effective solution possible. An open floor plan facilitates social interaction within the home and visual access to the outside. Natural daylight floods the space. Economical yet ample circulation connects spaces in logical sequence. Simple mechanical systems provide superior thermal comfort and fresh air in simple, set it and forget it fashion. Advanced building assemblies, thoroughly modeled in WUFI and THERM for their hygrothermal and thermal properties, deliver excellent performance as well as durability. The homes super-insulated shell, high-performance windows, and low-temperature radiant heating provide even temperatures throughout a draft-free home. An air-to-water heat pump and heat recovery ventilator provide heat and ventilation to the space super- efficiently. Productive: Generous daylighting, views to the outside, and fresh air ventilation provide a superior inside/outside connection, even as a super-insulated, airtight envelope provides a comfortable thermal haven. This protected prospect is a gracious space to occupy. Toxic-free construction coupled with the filtered fresh air from the heat recovery ventilator provide unparalleled levels of indoor air quality, allowing even the subtle fragrance of wood trim to be perceived by occupants. Operable windows throughout the home invite occupants to make a more direct connection to the outside, though often are left closed as that connection is already so strong. High performance windows with warm interior surface temperatures break the conventional cycle of convection that usually causes drafts in other homes. Radiant heating (and cooling) provide even temperatures throughout. Secure: A super-insulated high performance building envelope, coated with Prosoco Cat-5 liquid applied weather resistant barrier (designed to withstand hurricanes), shelters occupants from the elements. An endoskeleton of steel provides superior seismic resilience. Minergie-ECOs red list of toxic materials coupled with LEEDs material requirements dictated that the building be built with materials that are benign to both occupants and installers. The highest standards of fire safety were also pursued. Sustainable: As verified by its first-of-a-kind combination of Passive House, LEED and Minergie certifications, and further proven by its year of net positive energy performance, Karuna House meets the highest standards of sustainable construction. Revolutionary energy performance, aggressive water conservation, xeriscaping, nontoxic construction, locally-sourced materials, excellent indoor air quality, simple and optimized mechanical equipment, durable and maintenance-free assemblies, and more came together in the Karuna House project. Describe each phase of the project and how the eight design objectives were addressed. Project Phases include: Pre-design/Planning, Design, Construction, Operations/Maintenance, and Post- Occupancy Evaluation. Pre-design/Planning: The client and architect first focused on the aesthetic and programmatic goals of the project, with a general idea that energy performance and broader sustainability goals would also be addressed, but not a specific plan to reach those goals. Aesthetics and functional/operation excellence were the initial focus of schematic design. Soon, however, the client chose to pursue Minergie certification, including both the Passive House-like P certification and the LEED-like ECO certification. As a case study, he chose to also pursue Passive House and LEED certifications. Client, architect, energy consultant, and builder began to collaborate to realize a high design/high performance house that could meet these multiple certifications. Design: Client, architect, energy consultant, and builder harnessed the modeling and optimization power of the Passive House Planning Package, in tandem with SketchUp, THERM, and WUFI, to dial-in the energy performance of the building (shooting for net positive energy) without sacrificing the projects aesthetic/programmatic goals and while facilitating the broader sustainability imperatives of LEED and Minergie-ECO certification. The efficacy of this process was demonstrated well when the team had to significantly increase the energy performance in a cost-neutral way that did not negatively impact the homes architectural integrity. Accessibility, cost-effectiveness, functional/operation excellence, productivity, security, and sustainability were all addressed throughout the iterations of design. Construction: Thanks to intensive collaboration between architect, energy consultant, and builder, the construction of Karuna House not only achieved the highest levels of precision but became a national case study for high-performance building, with blog posts and video demonstrations hosted on the project website (http://hammerandhand.com/portfolio/karuna-house). The videos of high-performance building at Karuna House have been viewed 82,600 times to date, and have been featured on industry websites like Green Building Advisor. Details of the high performance elements of the construction of Karuna House were shared in Evaluation section previously. The assemblies were constructed with nontoxic materials, as stipulated by Minergie-ECO and, to some degree, LEED Platinum certification, so they pushed praxis even further. Blower door fan testing throughout the construction process ensured that the highest levels of airtightness were achieved. For Hammer & Hand, Karuna House was a lighthouse project that initiated a process of development in praxis that continues to infuse and transform the company. Everything about how Hammer & Hand builders' exterior walls, foundations, and roof assemblies has been affected by the learning process that started at Karuna House. Every project that Hammer & Hand now undertakes, regardless of its specific performance goals, involves the measuring of airtightness and understanding of heating/cooling loads to enable the design of strategies to ensure durability, comfort, and optimal energy performance. Inspired by the practices developed during the construction of Karuna House, Hammer & Hand has created and published a Best Practices Manual of baseline construction details that address moisture management and provide the design foundation for custom high-performance details. Operations/Maintenance: Operation of the house is, by design, simple and fairly maintenance- free. The one adjustment made was the addition of modest active cooling, incorporated into the existing hydronic coils. Post-Occupancy Evaluation: The home's PowerWise monitoring, coupled with homeowner feedback about comfort and overall experience of the home, provide a good picture of the performance of the home and its systems. Occasional overheating (during the summer, after the client returned to the home after several days away) led to the addition of active cooling mentioned above. Some simple adjustments to energy use patterns are increasing performance. A hot water backup element, left on, was consuming over 10% of household energy, for example: an easy-to-eliminate draw on energy. Karuna House is a manifestation of the many synergies that low-load, high-performance building harnesses. Daylighting provides solar gain. Balanced heat recovery ventilation maintains comfort inside the envelope while providing healthy fresh air. Ventilation helps mix air and provides even temperatures throughout the house. The low energy loads afforded by high performance envelope and mechanicals make heat gain from occupants and appliances a significant and valuable contributor to required heat. From a certification perspective, the project team discovered synergies as well. First, the energy focus of Passive House provides an excellent complement to the broader sustainability focus of LEED. Second, the P and ECO portions of the Minergie-P-ECO certification overlap nicely with the Passive House and LEED, respectively. So while achieving all the certifications at the same time while also achieving the aesthetic, programmatic, and net positive energy goals of the client was challenging, the certifications were harmonious in many ways. The performance of the building was measured during construction and at project completion by an independent, third-party PHIUS+ rater who measured airtightness, quality of high-performance assemblies, and modeled energy performance with REM/Rate. Air quality monitors confirmed indoor air quality and compliance with the strict environmental quality requirements of Minergie-ECO certification. Ongoing monitoring of energy use with PowerWise and energy generation with SunnyPortal confirmed net positive energy use after the first year of occupancy. Dialogue with the homeowner confirmed very positive experience with comfort, health, and performance of the home, with caveat that modest active cooling should be added so that the home can become comfortable quickly after a summertime trip away. Build a beautiful, comfortable, high-performance home. Build a net positive energy home that is part of the climate solution, durable enough to last for generations, and gracious enough to live in that people care for it for generations. Be the first building in the world to achieve LEED, Passive House, and Minergie certifications, in order to provide a case study for the industry about the leading green building certifications and their relative strengths and weaknesses. So, in addition to benefitting the client in multiple ways, the house also benefitted the green building community. As mentioned earlier, videos of the construction and design of Karuna House have been viewed 82,600 times to date. The home has also been featured in print and online publications throughout the US and Europe, including in Haustech, Wirtschafts Woche Green, Green Building Advisor, Inhabitat, Residential Architect, Sustainable Business Oregon, Daily Journal of Commerce, Earth Techling, and more. The house has been presented as a case study for many industry conferences, including JLC Live, North American Passive House Conference, Greenbuild, Passive House Northwest, and special AIA events in both Portland and Seattle. Please see the above narrative "energy performance was a central focus of Karuna House". Its PHIUS+ Passive House and Minergie-P certifications testify to the stringent energy requirements it achieved. And its energy performance data demonstrating that the house is net positive energy provide further proof of its high-performance bona fides. A thorough description of how Karuna House achieved these levels of energy performance is recounted in the narrative sections above. Energy use data is from actual, circuit-by-circuit metering data monitored by a PowerWise system. Energy generation data is from actual PV generation as reported by a SunnyPortal system. Nontoxic materials combined with balanced, filtered heat recovery ventilation and building assemblies with excellent hygrothermal performance ensure superior indoor air quality. Air quality testing, required for Minergie-ECO certification, confirms the results. Natural daylight and superior thermal comfort further ensure an excellent indoor environment. As a durable structure, with assemblies characterized by excellent hygrothermal performance, Karuna House's lifespan will be measured in generations rather than years. And as a low-load, super-insulated structure with onsite solar generation, the house provides significant resilience in the face of possible disruptions in the energy grid. Even in the winter when the homes solar array will not provide enough energy to fully power the home, the buildings ability to capture and retain solar gain and the heat from occupants will maintain temperatures in very livable range. "Three for Three," by Brian Libby. GRAY Magazine Issue No.18 (Print Issue & Online), October 2014. "Going all Out: Karuna Passive House Achieves Triple Certification and Claims a Prize for Style and Elegance," by San Jose Green Home. San Jose Green Home, May 3, 2014. 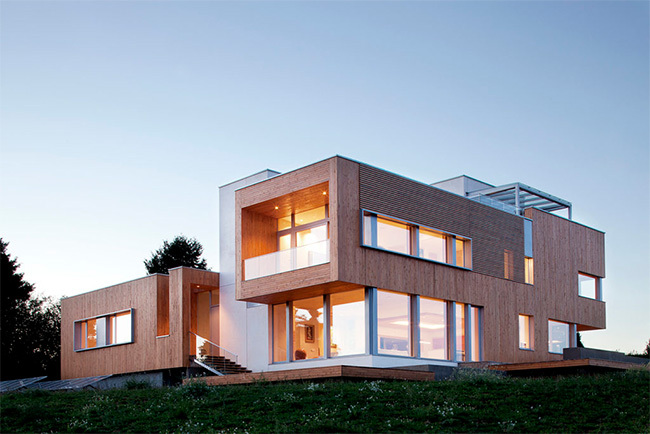 "Net Zero Energy Karuna House: LEED + Passive House + Minergie = Green Building, Triple Crown," by Modern Enviro, Modern Enviro. "Karuna House Achieves Green Building Triple Crown," by Mignon O'Young. Green Architecture and Building Report, January 16, 2014. "Karuna House Becomes the World's Greenest House by Christine Walsh. Jetson Green, December 9, 2013. "You Might Call This the World's Greenest House," by Pete Danko. Earth Techling, December 4, 2013. "Karuna House," by Holst Architecture. Contemporist, November 19, 2013. "Holst's Super-Green Willamette Valley House," Portland Monthly Magazine, October 15, 2013. 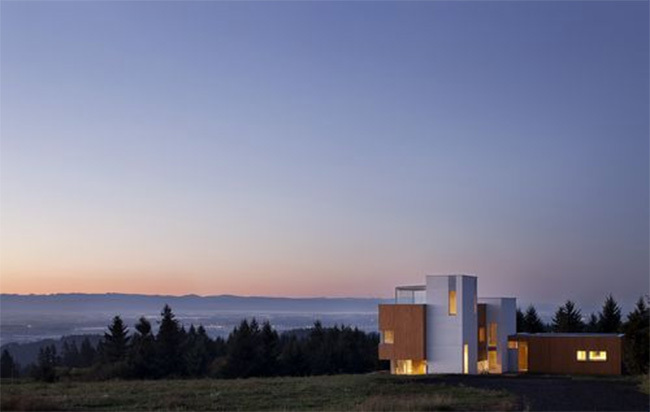 "Holst Architecture's Karuna House Aims for Triple Certification in Oregon," by Katie David. Inhabitat October 10, 2013. "Low-energy, few hassles: A look at the Lemelson passive house," by Andy Giegerich. Sustainable Business Oregon, September 26, 2013. 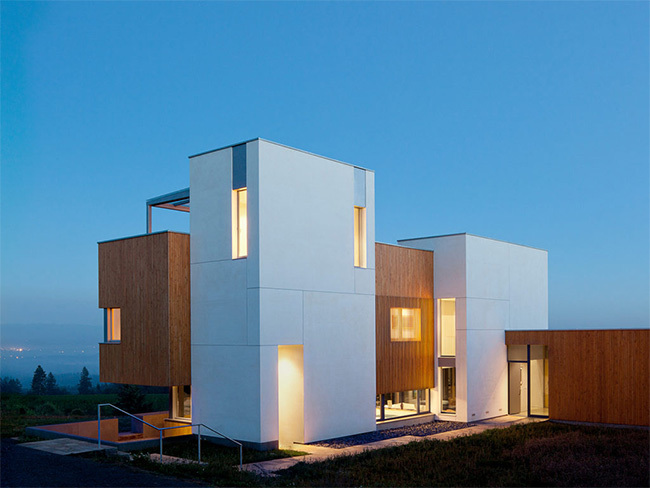 "Project Spotlight: Karuna Passive House" by Jonathan C. Imagine Energy, February 6, 2013. "Oregon home to meet trifecta of green rating systems," by Reed Jackson. Daily Journal of Commerce, April 3, 2012. "Triple Crown: An Oregon project pursues three green certifications," by Bruce Snider. Residential Architect, February 22, 2012. "Karuna House: One Project, Three Certifications," by Richard Defendorf. Green Building Advisor, November 9, 2011. "Home building team shoots for 3 green standards," by Lindsey Obrien. Daily Journal of Commerce, October 31, 2011. "Green USA: Karuna ist das grnste Haus der Welt," by Sabrina Kessler. Wirtschafts Woche, December 9, 2013.